Nepal’s current situation comes off as a political conspiracy. Everything seems very strategically planned. First, we drafted a constitution and then right before we officially passed it, we made a major change demanded by a certain group. Second, when a similar demand was made by another group, we totally ignored it, even when two big representatives of our neighboring country India advised us otherwise. The politicians who passed the constitution were warned well beforehand that what they were doing was wrong and that there would be major consequences from Madhes. Additionally, the political leaders knew from history that India would not remain quiet since the Indian envoys came straight from Prime Minister Modi’s office to keep the proportional representation clauses in our constitution. Our politicians are either very stupid or very lazy or very cunning and greedy and may have hatched some plot to use these settings to their advantage. Either of those answers mean that they are not fit to run the country. Most people might get the stupid part but won’t get the cunning and plotting part. Regarding the latter, by purposely undermining the 1989 Indian Blockade to Nepal, the politicians paved the way for yet another blockade in modern day and age. Even when the first blockade happened, as per the home minister at that time, Nepal already had prior information and it started collecting fuel and other goods beforehand. They even created oil storage tanks and were able to sustain the blockage for over a year. It is hard to believe that we did not have such information in this modern day and age and that we have fuel shortages despite our huge storage capacity. First, the shortage reignited a great anti-India sentiment and painted Madhes as ruthless traitors who partnered with the enemy to starve its own people. Although what India was doing to Nepal is what Nepal has been doing to its Madhesis for years, Madhes became the villain and their cause was undermined. Second, their demands were sidelined in the pretext of a need for retaining power from India taking over. Now, let’s say if the part where “retaining power from India taking over” was not the real reason, then what could it be the alternative? If we dig deeper into who would it benefit most, things become clear. If clauses like proportional representation based on population or naturalized citizens being allowed to take high posts were allowed then the power would be taken away from our ruling class khas arya (hill Brahmin-Chhetri) leaders. Therefore, the PEON (Permanent Establishment of Nepal), as coined by C.K. Lal, had a deep self-interest to remove those clauses and they justified it by stating that since most Madhesis are Indians, our country would be ruled by Indians. This is the most absurd excuse to justify a 21st century discriminatory constitution, especially when the heading of our constitution states that it stands for peace, prosperity and equality. What an irony that we suppress our own people for the fear of being taken over but we take pride in being the land of the brave Gorkhalis! Somewhere, along that heading we should also add “And we fear Indians taking over our country so we will bend the “peace, prosperity and equality” part so that our fear doesn’t come true.” What an irony that we suppress our own people for the fear of being taken over but we take pride in being the land of the brave Gorkhalis! Coming back to the conspiracy theory, the constitution will be reviewed only in 20 years instead of 10 years? First, it is written by these corrupt and greedy politicians. Second, we are a growing nation and changes may be needed sooner than later. Does it benefit the nation or the ruling class few to retain power when the change is only every 20 years instead of a smaller time period? It is clear again who benefits the most by this provision. The calculated consequences of removing the clauses and the nature of events that followed together with the media frenzy point towards a very well hatched plan. The media failed to covered, let alone support, the Madhesi andolan that had been going on for weeks, yet it jumped to fuel the fire of anti-India and the fear of Indian politics. Even though we have complete freedom of the press, by international standards we cannot claim to be free press. Could the media be a part of the conspiracy to retain power of a certain class and certain leaders? Coming to think of the lack of action by our politicians during the earthquake, I wonder if these guys were busy hatching such plans against our nation and our people. They are the ones who benefit the most by creating this divide, by suppressing the Madhesi revolution and giving it a bad name. The biggest blame came on India and Madhesi leaders while our leaders took only a small portion of the blame for being incapable. But maybe there is much more than just their incapability and maybe their history of corruption and crimes can shed a bigger and brighter light on these events. Some questions we should ask are: How does making a fair representation of the population in the constituent assembly become a bad idea? Doesn’t it also mean that those underrepresented and under resourced people will not get a voice? How is removing a big pool of candidates, our naturalized citizens, to fill our high posts and that too of a country that has been suffering from corrupt ruling class a good strategy? What about all those naturalized citizens who have a great love for our country and may be more qualified than our India fearing Nepal-born, by descent citizens? Since our country will never give a chance to these citizens, automatically we ensure power among the same corrupt ruling class. More importantly, how does giving the right to fathers to give citizenship by descent and taking the right away from mothers make our constitution a great one, and make our country as great of a nation as we have in our minds. How can women and youth be fairly represented in the constituent assembly to signify these very important demographics of our country? Our leaders have severely underperformed, and maybe we played a part by not expecting much from them in the first place and by letting them get away with the worst of performances in history and in the present. I wish true greatness and true freedom for our country and our people. True greatness and true freedom doesn’t come without a great struggle. It is time to let go of the theoretical greatness of the past as we have hung to them for a long time. We cannot hide under the sword of Prithvi Narayan Shah and under the chants of the brave Gorkhalis nor at the birthplace of Lord Buddha nor the great Mt Everest. We need to create a new greatness for our country. 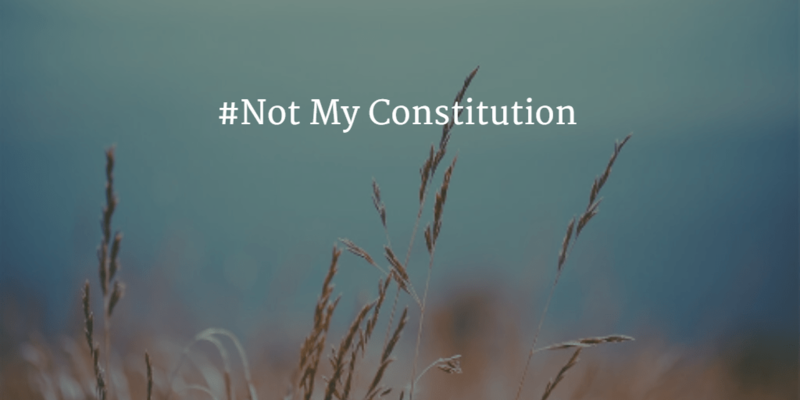 Our constitution stands for a lot of things and we need to fight and make it right to ensure that it stands for its true meaning. We cannot depend on our current leaders to make us great. They are damaged goods and truly do not understand what it means to lead the country to what it aims to be. Did they hatch this conspiracy? Maybe, maybe not, but these guys should not be the ones deciding what stays in or out of our constitution. If we do not awaken ourselves, put our working boots on and wake up with an intense fervor to strive and struggle for greatness, we are truly in some deep gobar.